(Host) We’ve become accustomed to the fact that the price of gasoline is rarely the same from fill-up to fill-up. But what concerns many people these days is how high the price is. As VPR’s Steve Zind explains, Vermont gas prices are influenced by a complex combination of local and global factors. (Zind) Few people watch gas prices more closely than Bob Moreau. His convenience store is one of four in the village of Randolph. Moreau says he and his competitors play a daily game of ‘I Spy’ to make sure their gas isn’t priced too high or too low. (Moreau) "I see the guy from Champlain Farms come over here to the corner and look and I see the guy from Exxon come over to the corner and look. And they must send somebody from Cumby’s up. I see them every day." (Zind) Local competition, labor costs and property taxes explain why gas prices vary from town to town. Moreau says his profit stays the same, about 10 cents a gallon, no matter what the price of gas is. But he hears from customers who think he’s lining his pockets when prices rise. (Moreau) "Oh, all the time! Everybody thinks we’re gouging." 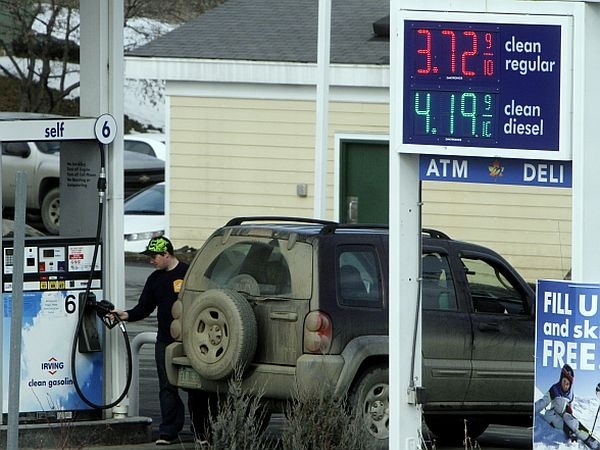 (Zind) The record high for Vermont gas was in July of 2008 when the average price for regular unleaded hit $4.09 a gallon. By November, just four months later, it had dropped to $1.97. Explaining why prices go up and down like that is a topic of great debate. There’s general agreement that demand for oil, refining capacity, political tensions and market speculation influence the price. But there’s disagreement about the role each plays. Matt Cota heads the Vermont Fuel Dealers Association, which represents retailers. Cota says huge amounts of money invested in the futures market actually drive oil prices up independent of supply and demand. He says when the price gets high, investors cash out and that’s what causes dramatic fluctuations. Cota cites a warning from the investment bank Goldman Sachs that speculation causes oil prices to spike. (Cota) "Speculation is important. We can’t live without it. What we’re saying is that there’s too much speculation out there from financial players who have no interest in the underlying product. Now that happens in tech stocks, it happens in all sorts of different things. The problem is when it comes to oil, we’re dealing with an essential commodity that makes our economy run." (Zind) Cota supports regulations that would clamp down on oil speculators. Without their influence on gas prices he says gas prices would be less than three dollars a gallon. The other side of the argument is gasoline prices are mostly driven by supply and demand. Joseph Choquette is a Vermont lobbyist for the American Petroleum Association which includes companies that produce oil. (Choquette) "If speculators were really moving the market just for gain there would be a big increase in supply and it wouldn’t be worth much anymore. But that doesn’t happen, so we think it really has to do with supply and demand and that petroleum products are a world market and that’s the biggest influence on our prices right now." (Zind) Neither Choquette or Matt Cota of the Fuel Dealers Association is willing to speculate on where Vermont gas prices are going in the coming months.